Skilfully crafted by traditional goldsmiths on the Atlantic coast of northern Spain, this beautiful sterling silver Camino Flower necklace features a scallop shell surrounded by petals. 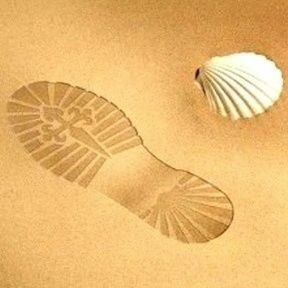 The scallop shell is symbolic of the Camino de Santiago - the 1,000-year-old journey to the shrine of St. James in the Cathedral of Santiago de Compostela, known as the Way of St. James (El Camino de Santiago - in Spanish). Some people walk, others travel by bike. Many travellers choose to do the Camino for personal, rather than any spiritual or religious reasons - taking time out from their busy/modern lives and perhaps finding inspiration along the way, whilst reflecting on their life in a supportive environment. Many carry with them a Scallop shell symbol like this. Everyone experiences the journey in a different way. If you want to wish your friends or colleagues well, and show them how much you care, let us send this symbolic present on your behalf. It is the ideal gift for any special event / occasion, particularly for someone starting out on a new adventure in life - like a new job, travelling afar or even beginning retirement. Whatever somebody’s journey - whether on El Camino itself, on holiday, a business trip, a gap year, trekking, etc, many friends and loved-ones like to pass on a special gift to wish the recipient well on their travels - and safekeeping along the way. 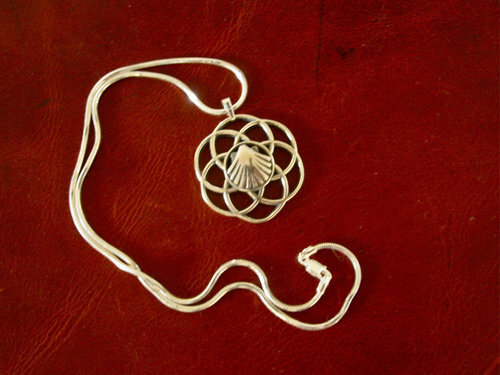 Gift this lovely scallop shell necklace to inspire a friend or loved-one: A truly meaningful gift. Comes gift-wrapped, like all our presents - and we can print a personal message on your behalf.